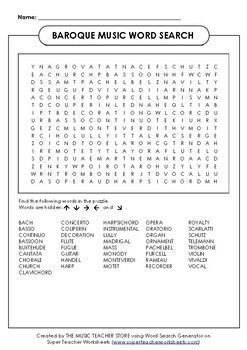 INCLUDED IN THIS WORD SEARCH ARE THE NAMES OF MAJOR BAROQUE COMPOSERS AND MANY IMPORTANT TERMS FROM THIS MUSICAL TIME PERIOD. FOLLOW THE MUSIC TEACHER STORE FOR NEW PRODUCTS AND UPDATES! 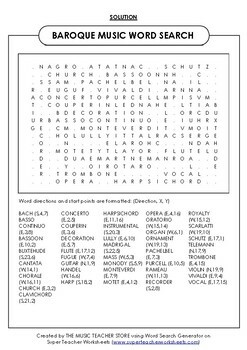 AS ALWAYS, HAPPY MUSIC TEACHING!